St. Louis-Lambert International Airport may have less than 50% of its former traffic, but that hasn’t stopped airport officials from continuing to dream of major projects and upgrades to airport buildings and facilities. a new building between the two terminals where Concourse D now stands, possibly a hotel or parking garage. According to Kristen Linton, public relations officer for the airport, the image is a part of the airport’s Master Plan, which includes theoretical design evolutions of the airport’s facilities for potential scenarios. A major upgrade or replacement of one or more concourses at Terminal 1 has been something airport officials have desired for a long time, but have not had the financial means, passenger volume, or practical opportunity to complete. From an operational perspective, both Concourse A and C are considered to be closer to the adjacent Taxiway C than desired, their distance requiring flights departing from the gates on the north side of the concourses to pull back into the taxiway, temporarily blocking the passage of other airplanes using the taxiway. The new concourse depicted would be 500 ft from the taxiway centerline, 154 ft farther than the current Concourse C and far enough to permit planes to pull back from the gates without blocking traffic on the adjacent taxiway. Linton said that no plans are in place to execute this design and that the design will only proceed if and when it is deemed justified and appropriate. Lambert “mothballed” portions of the airport following a severe decline in passengers in the years after American’s de-hubbing of the airport in the mid-2000s. Concourses B and D were closed in 2008. Concourse C beyond gate C28 was closed after being damaged by a tornado in 2011 and has not reopened. 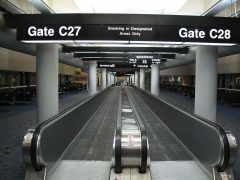 Meanwhile, a recent growth spurt led by Southwest Airlines has prompted airport officials to renovate portions of Concourse D and renumber the gates as part of the E concourse E34-E40. Passenger traffic at St. Louis-Lambert International Airport increased by 10 percent in 2016 reaching almost 14 million, a level the airport has not seen since 2008.